Wrench storage to keep the sizes organized. Wrench storage can be rather chaotic. Different sizes, metric vs standard. Or even separating different types of wrenches such as boxed end vs ratchet wrenches. Here are some ideas for you. Any farm supply store has them. Often times even department stores can have them. Hitch pins make great ways to store wrenches. 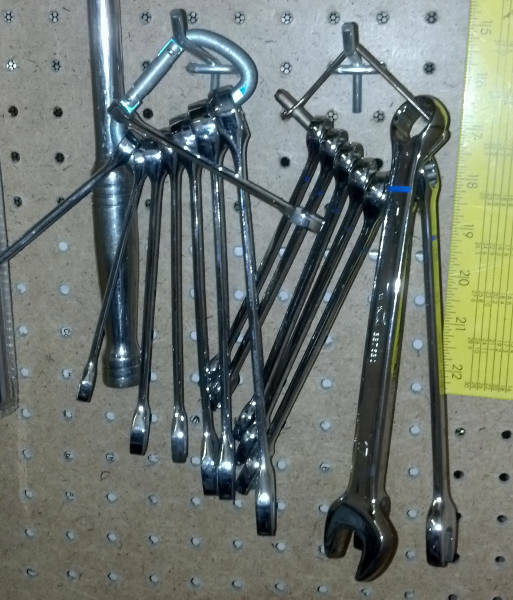 They keep the wrenches in order of size if you put them on that way. Storage is compact while keeping order to the chaos. Installation of the wrenches is easy. Pull the loop end of the wire over the pin part to open the hitch pin. Slide the wrenched on in the order that you want them in. Once you get the wrenches on there that you want. Pull the loop over the pin to lock them in place. 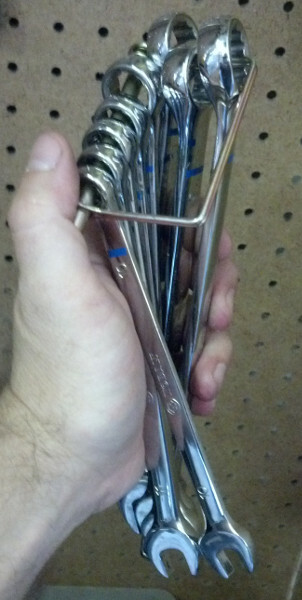 A carabiner also works as a way to store and organize boxed end wrenches. They are a bit more cumbersome than the hitch pins for getting the wrenches on and off. But, you can pick them up about anywhere. Heck I've even seen them in convenience stores. You don't need a super strong one. Just one that quality enough that the spring loaded latch doesn't fly off. You can put Metric wrenches on one and standard on another. Hang 'em like I have done here. I have an old discarded server rack that I hang some of my tools up in.